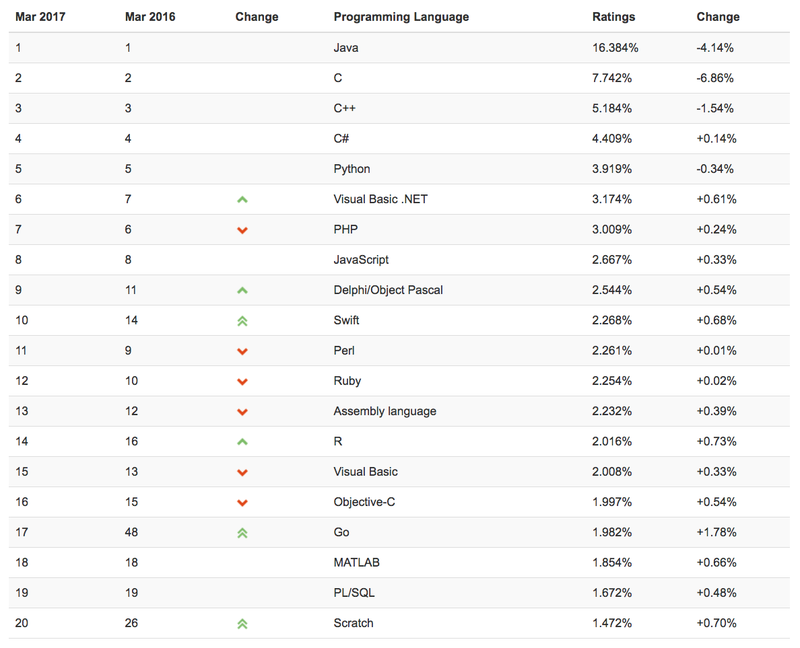 In March, the Swift programming language rose to became the 10th most popular, at least by the measure of TIOBE Software. Open-sourced by Apple in 2015, Swift has been touted as an appealing alternative to better-established programming languages because of its safety, speed, and approachable syntax. It combines modern language features like garbage collection and type safety with readability, not to mention decent documentation. Swift is also ranked 10 in the PYPL Index, which derives its data from Google Trends. RedMonk's ranking from 2016 shows Swift a bit further back in the pack. TIOBE, which has been keeping track of programming language popularity since 2001, searches for specific programming languages across some 25 search engines and aggregates the results to form its yardstick for popularity. The code quality assessment company suggests that Swift's adoption hasn't matched expectations because so much legacy macOS and iOS code is written in Objective-C and is being maintained rather than migrated. "Since Swift is mainly intended to write applications in Apple's ecosystem, it is expected that it won't rise much further," the company said in a post. Companies like IBM and PerfectlySoft, however, appear to be convinced Swift has potential as a server-side language outside the Apple ecosystem, mainly because it can run with a modest memory footprint, making it in theory less costly to run at scale on cloud infrastructure than Node.js or Java. Swift's main competitor outside of established options like Java appears to be Go, released by Google in 2012. But C#, a mainstay in the Windows world and game programming, deserves consideration due to Microsoft's push into cross-platform tooling. If Google decides to support Swift as a first-class language for Android development, Swift would enjoy a huge surge of interest. Swift also happens to top GitHub's list of programming languages being actively developed on the site (which of course omits development activity elsewhere).